In mid-19th Century California ice and fresh cold water were very difficult to come by. Therefore, brewing the lagers that many of the dock workers and gold-miners were accustomed to was an impossibility. So, like all great food and drink discoveries, necessity bred invention; and a new style of beer was born. When San Francisco brewery Anchor Steam was purchased in the 1970s by Fritz Maytag, it ushered in the North American craft beer revolution. He copyrighted the name “steam beer” forcing other breweries making steam beers to rethink the name. The style eventually came to be known as a California Common. The brickyards in Toronto’s east end were among the largest employers in the area during the mid-late 1800s. Many of the homes still standing in and around East York, Leslieville, and Riverdale were built with bricks fired by brick makers in these yards. It’s unlikely they were drinking steam beer, as ice and fresh cold water have always been plentiful here in Ontario (perhaps you’ve noticed). But as a way of honouring our local labour history, we’ve named this beer, Brick Maker Common. 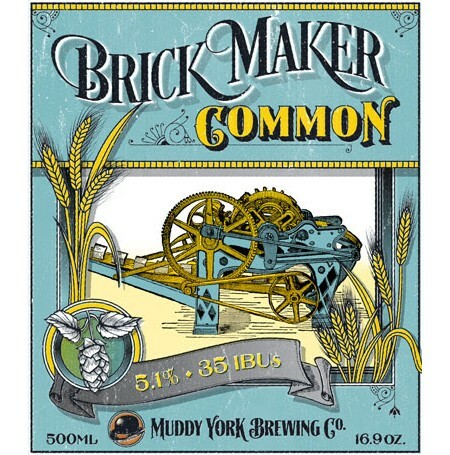 Brick Maker Common is available now in 500 ml bottles and on tap at the Muddy York retail store and taproom.